PawFlex is a registered trade mark of PawFlex Inc. Simply PawFect is a registered Trademark and our Brand name of PawFlex Inc.’s Pet product division. In March 2011, at the Global Pet Expo in Orlando Florida, Simply Pawfect introduced its new product line of bandages designed specifically for animals called PawFlex Bandages. We are a company dedicated to creating the best pet products for today’s pet market. 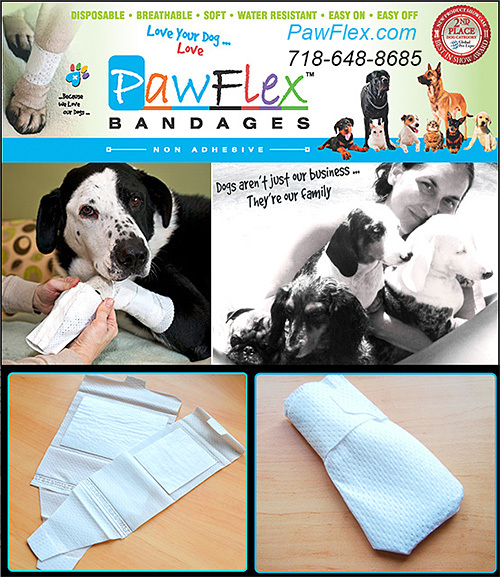 PawFlex Bandages are our first new product line launch. We have several other products in patent pending status that we hope to introduce over the next year. PawFlex super stretch material flexes in all joint degrees and angles and moves gently and smoothly with your active dog. PawFlex is gentle and soft enough for the tiniest breed and strong and tough enough for the largest of breeds. Aside from coming in sizes XSmall to XLarge we offer 2 different widths to accommodate not just dog size but wound size as well. PawFlex Basic Bandage is for any part of your dogs’ leg. This bandage was specifically designed to bend with, Flex and mold to your pet’s joints, large wounds, open paws and tails at any angle with absolute comfort and ease. Its gentle and its ergonomic construction allows your dog total freedom to move, run and play without any restrictiveness or discomfort. Again, no worry about slippage as each PawFlex design has a built- in non slip grip created specifically for fur. We suggest using the bandage cover with both PawFlex Basic and Joint Bandages if your dog needs extra protection from biting or gnawing at his wound and/or bandage. The tubular bandage cover is easy to slip on and off and is totally hassle free. It has a built- in non slip grip and is water resistant. The cover is tubular which means there are no ends to unravel or open. In other words it’s virtually impossible for your pet to get it off…unless of course he’s Houdini. Many dogs won’t require the bandage cover/protector but every dog owner knows their own dog and can make that judgment call on an individual basis. PawFlex Tubular Bandage Cover/Protector comes as a standard addition in each box of Basic and Joint Bandages. It is also sold separately. This bandage is for your dogs paws. It has no designated front or back so you can direct the wound pad portion directly over the wound no matter where it is located on the paw. The fastener is a non-slip strap with Velcro®. What Makes PawFlex So Special? PawFlex bandages are a disposable, non adhesive, breathable, soft, super stretch bandage with a wound pad already attached. It is the first “all in one” “ready to go” bandage for dogs. It’s Easy On Easy Off feature makes PawFlex the easiest bandage to use. PawFlex bandages double catch fastener offers maximum adjustability and security. Because there are no adhesives tugging at their fur and the fabric is soft like cotton your dog will be totally comfortable in PawFlex bandages and forget that they even have one on. Will PawFlex Bandages Stay On? Yes, thanks to the unique double catch fastener, super stretch material and non slip grip, PawFlex was designed to stay on. We also offer in every box PawFlex bandages protector/cover. The cover is tubular which means no ends to unravel or open. Pawflex is made from a super soft and high stretch material that molds, flexes and moves gently with your dog throughout their daily activities. And of course, Non adhesive means no fur pulling. PawFlex bandages are water resistant which means they will repel water unless fully submerged. You needn’t worry about bandage becoming waterlogged from licking or rain drops. Because they are not fully waterproof they maintain good breathability at all times. What Are The Benefits To Using PawFlex Bandages For Wound Care? PawFlex bandages create a clean environment for your dogs wound to heal. Because they are water resistant and breathable there will be no moisture build up which can be a breeding ground for bacteria. Your dog will also not be tempted to lick or bite because of the discomfort of adhesives. Also, because changes are so easy, it is likely that they will be more frequent when using PawFlex bandages. Why PawFlex Over Other Dog Bandaging Protocols? Simply stated; PawFlex is in a class by itself. Traditional methods of bandaging have been with adhesive tape and gauze or cohesive wraps and gauze. Pawflex is the first all in one bandage without adhesives. While the traditional methods are time consuming to put on and take off , Pawflex is truly easy on easy off. Traditional bandaging usually needs to be removed with a scissor and plenty of fur pulling which causes pain, discomfort and stress. PawFlex bandages require you to just lift the velcro-type tab and release. That’s literally all it takes. PawFlex can be secured over a wound in 1 second flat and released in less than a second…PAINLESSLY. What bandage on todays market can do that? For more information about our bandages and to place your order, please contact us today!